At the risk of hyperbole, can I say that these are among my favorite things I've ever baked? I'm sure I've said this same thing about many other dishes I've made, but this time, I swear I really mean it! I really thought a lot about how I wanted these to taste (for like, two years, ever since I first put preserved lemons in curd. Check out the hyperbole when I talk about curd in that post too!). I knew the recipe I was going to try to adapt (Melissa Clark, how could I go wrong?). And so, three weeks ago, when the arrival of Spring had me craving lemony sweets, I filled up a jar with lemons and salt and waited eagerly for the day I could realize my dreams. I don't think it would be fair to say that I failed miserably on my first attempt, because the end result, while messy, was incredibly delicious. But, considering that instead of setting as promised, my filling ballooned up and over the sides of the tart pan in a volcano of lemon mockery, I'm not sure I can honestly call it a success. I certainly wasn't going to photograph it. As I stood in my kitchen, scraping the overflow of curd off the baking sheet with a spoon, I tried to figure out where I went wrong. 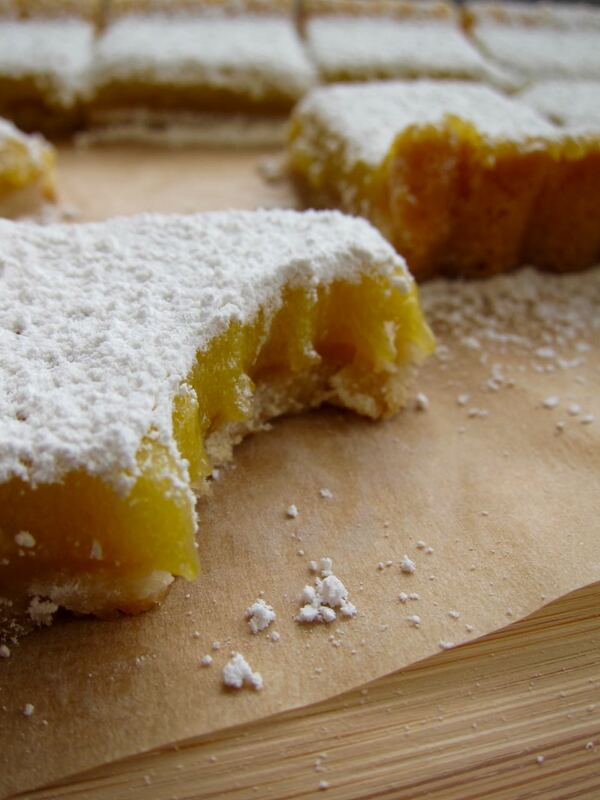 This is the part where I admit I've never made lemon bars before. Ever. And if you've been reading this blog for a while you know I have a spotty history with curd (just so much failure, near failure, and unnecessary masochism). But I am stubborn, and ever overconfident in my ability to succeed at a recipe on my first try, even when messing with the science of yolk ratios and acids and salt and baking pan sizes. This confidence might be charming if it didn't so often lead to disaster. And yes, I did all of the above here. I cut the recipe by 1/3. I changed the baking pan type. I messed with the acidity and salt content by subbing preserved meyer lemons. Oh, and I was also going off of a recipe already made trickier because it uses olive oil in place of butter, because of course I was. I'm not sorry, but I do recognize I made this harder on myself. So I tried again. I carefully baked off the crust and filled it with curd that I stirred into existence with reverential care. Then I baked it off, parking myself in front of the oven with a CONSTANT VIGILANCE! that would make Mad Eye proud. In the end, I won out over the curd gods in my own Easter miracle. Jesus rose, my curd did not. I dusted my beautiful creation in powdered sugar and enjoyed. Amen. Make the crust: Pulse all dry ingredients and the zest in a food processor, then add the butter pieces and pulse until a dough forms (it will be crumbly). Press into a 14x4.5 inch tart pan with a removable bottom, about 1/4 inch thick. You will have a little extra dough for snacking. 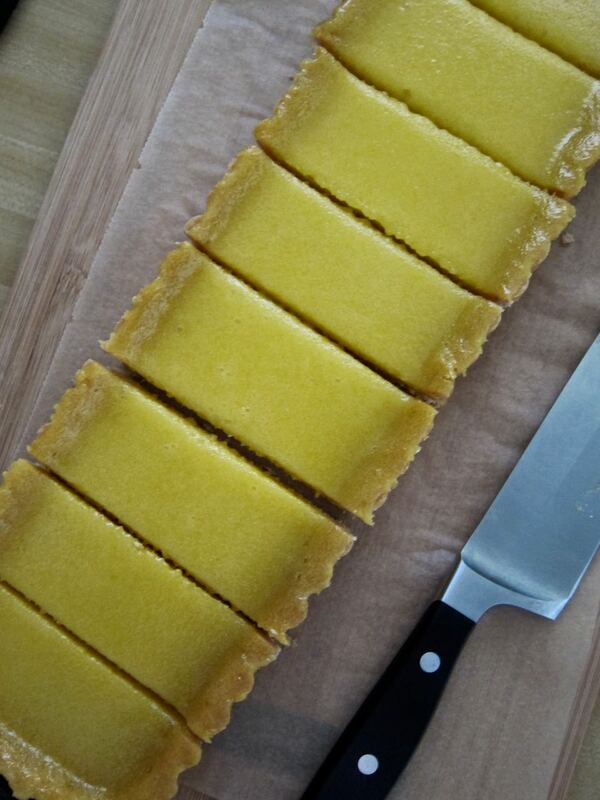 Place the tart pan on a rimmed baking sheet and bake at 325 for 30 minutes, until golden. The shell will shrink down a bit and puff up. While shell is baking, make the filling: In a small saucepan, rub the zest and the sugar together to release the oils in the zest. Add the fresh lemon juice, preserved lemon juice, egg, yolks and cornstarch. Whisk over med-high heat, about 5 minutes, until it comes to a boil. Boil for at least 30 seconds but no more than 1 minute. The curd will thicken, but if you over boil it will thin out again. Remove curd from heat and strain into a bowl, then whisk in the butter and olive oil. Using the back of a small spoon, smooth down the puffed crust as best you can to deepen the shell. Pour in the filling and bake 10-15 minutes, to just set. Curd will appear to be very jiggly and not set at all, but if you see it start to bubble and rise, remove it from the oven immediately. Cool to room temperature, then chill until firm. 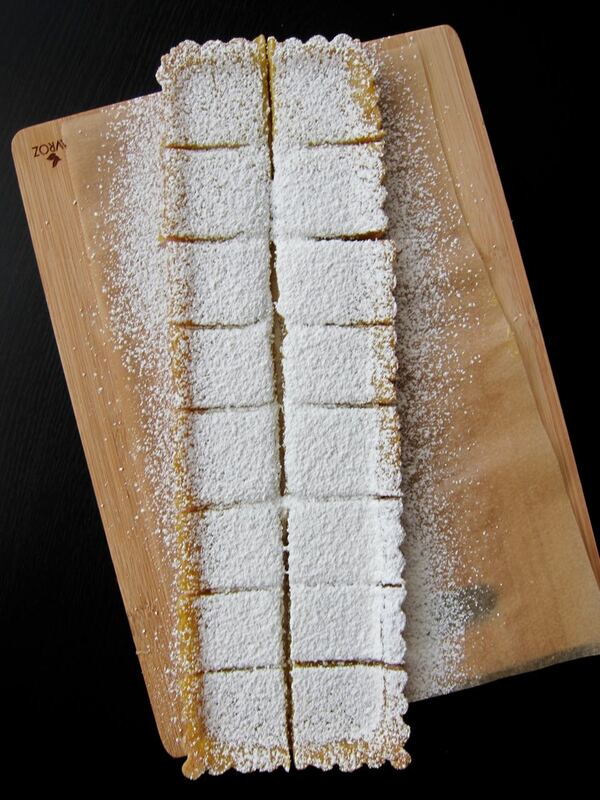 Cut into 16 squares and dust liberally with powdered sugar. Version 3 is happening, and I'm going all in with 100% preserved lemon. What can I say, I just want more of that salty, briny lemon joy. If you don't want to do that but you want a little extra salt, sprinkle some flaky sea salt on top of the powdered sugar before serving.